Mickey Cohen — short, foul-mouthed, even fouler tempered — began his career as a boxer. 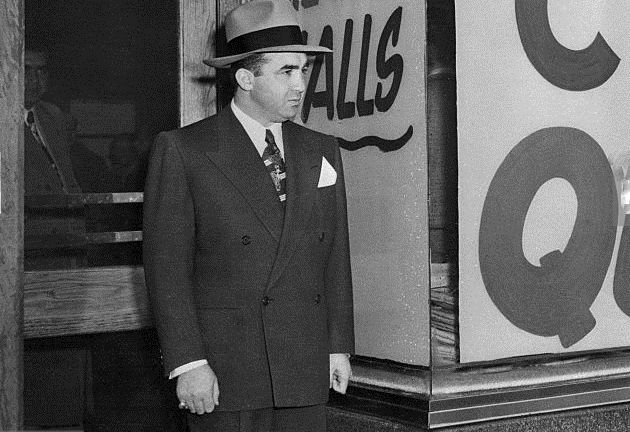 On 15 May 1945 he murdered Chicago bookmaker, Max Shaman, before graduating to become the bodyguard of Bugsy Siegel (search the article) and supposedly inherited Siegel’s empire when he was murdered in June 1947. Following Siegel’s death, Cohen walked brazenly into the lobby of the Roosevelt Hotel at 7000 Hollywood Boulevard in Hollywood and emptied the contents of two .45s into the ceiling, shouting for the killers to make themselves known. When only the police arrived, Cohen fled. Cohen had many of the neuroses typically associated with short men — he was 1.65 m (5 ft 5 in) — and he began to shoot his mouth off, bringing the activities of his friends and erstwhile colleagues to the awareness of the authorities. Cohen presented himself to the press as a villain misunderstood by an underworld, led by Jack Dragna, that made several attempts on his life, including twice bombing his home on Moreno Avenue in Brentwood. On 6 February 1950 he was most upset that 40 of his $300 suits were shredded by one of the explosions which left him, his wife, their maid and dog unharmed. He hired Johnny Stompanato (search the article) to be his bodyguard until he was killed in 1958. Ever the gentleman, Cohen sold Lana Turner’s love letters to Stompanato to the press and had Stompanato buried in a cheap coffin. In Tinseltown Cohen ran a jeweller’s and sidelined in gambling and sexual blackmail. In 1950 he appeared before the Kefauver Committee and when asked, “Is it not a fact that you live extravagantly… surrounded by violence?” Cohen replied, “Whaddya mean ‘surrounded by violence’ “? People are shooting at me.” As a result of his appearance on 20 June 1951 he was convicted of tax evasion and sent to prison for four years. On his release he became a minor celebrity and had fingers in many pies. He appeared on television and told interviewer Mike Wallace “I have killed no man that didn’t deserve killing by the standards of our way of life.” In 1961 Cohen was sent to Alcatraz for tax evasion where, in 1963, a fellow con tried to kill him by staving his head in with a lead pipe. Cohen was released in 1972. He died of a heart attack in his sleep on 29 July 1976.